There isn’t a doubt in most people’s minds that the Kardashian girls are no strangers to plastic surgery. However, there has always been some controversy where the eldest Kardashian is concerned. Kourtney Kardashian has frequently been rumored to have had a few procedures done, though she has only openly admitted to one. Is this because she has only had the one surgery? Or is it because she is too embarrassed to admit to any others? By looking at photographs from some years ago and comparing them to present day images, we can speculate that Kourtney has undergone more than one procedure. The first of Kourtney’s surgeries was a breast augmentation, she has openly admitted to on numerous occasions. She has stated in various interviews that, as a young girl she wasn’t thrilled about the size of her chest, so at age 22 she made the impulsive decision to go under the knife. Always a smart girl, she chose a well known plastic surgeon who took her from a small B cup to a full C cup. Throughout the years since her procedure, the Kardashian has admitted to experiencing feelings of regret at certain points, even claiming in an interview that she would look at pictures of her smaller breasts and think that they were perfectly cute the way they were. However, she seems to have come to peace with her decision, and has embraced her fuller breasts. Her boyfriend and father of her three children, Scott Dissick, is also an outspoken fan of her surgically enhanced chest. [SEE ALSO] Angelina Jolie, Kaley Cuoco & Kim Kardashian breast implants before & after! 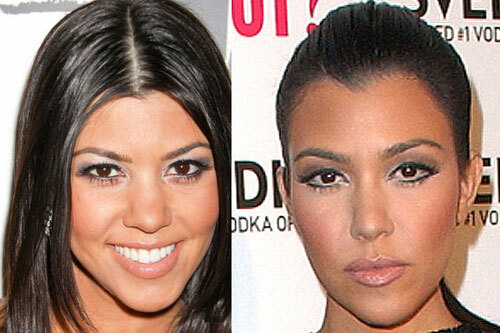 The second of Kourtney’s surgeries is somewhat more controversial. The star has never openly admitted to having a nose job, and many wonder why someone who so readily admits to having a breast augmentation would deny a second surgery. Yet, if you study photographs, it is hard to deny that there is a definite difference in the appearance of her nose. Now, as most people know, the Kardashians are famous for their contouring makeup tricks, some of which can be used on the nose to make it appear smaller. [READ MORE] Ben Savage, Blake Lively & Beyonce nose job before & after! However, Kim and Khloe Kardashian tend to use these techniques more so than Kourtney, and if you look at recent photos of Kourtney without any makeup, her nose does appear both slimmer, and somewhat shortened at the tip compared to how it used to look. Though the differences are certainly subtle, they seem to be the results of a skilled surgeon’s knife, rather than simple makeup tricks and camera angles. Regardless of what Kourtney Kardashian has or hasn’t had done to her body, she looks great, especially after giving birth to three children! Kourtney is a perfect example of why celebrities should always stick with highly skilled, professional plastic surgeons for the most natural, gorgeous results.